Nashville Post informs business and political decision-makers of what's happening across Middle Tennessee. The magazine reports on the people and issues that define Middle Tennessee business and shape its future. By fulfilling its mission to be relevant, educational and entertaining, Nashville Post has made itself indispensable to Middle Tennessee's business community, promoting the region's vibrant and sophisticated quality of life and work. We appreciate your input and thank you for your time. Representatives from several advertising industry groups and student newspaper publishers are asking the Supreme Court to overturn Virginia's state law banning alcohol ads in college newspapers, arguing that the law represents an unconstitutional restriction of First Amendment rights. While the First Amendment provides powerful ammunition to advertisers and publishers in court, if the challenge succeeds, they may find themselves on the wrong side of public opinion amid growing concern over underage drinking. Representatives from the American Association of Advertising Agencies, the Association of National Advertisers and the American Advertising Federation are lending their support to newspaper publishers from several big Virginia schools, including the University of Virgina and Virginia Tech, which are asking the Supreme Court to strike down the Virginia anti-alcohol ad law — overturning an earlier court of appeals ruling that upheld the law. In addition to asserting that alcohol ads are protected by free speech, the advertisers and publishers said many readers of college newspapers are old enough to drink alcohol legally. The publishers also say the alcohol ad ban, enforced by the Virginia Alcoholic Beverage Control Board, deprives them of badly needed revenue at a time when other kinds of print advertising are imperiled. In addition, they argue that underage readers will be exposed to alcohol advertising in other publications, regardless of the college-specific ban. 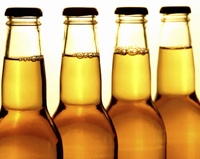 These legal developments come on the heels of a report from the Center on Alcohol Marketing and Youth (CAMY) at Johns Hopkins' Bloomberg School of Public Health, which found that wine, beer and spirits advertisers have mostly complied with their voluntary commitment to decrease the amount of youth exposure to alcohol ads in consumer magazines. In 2003, alcohol advertisers agreed to a voluntary standard that included not placing ads in magazines with youth readership comprising more than 30% of the total audience. Activists attempting to reduce underage drinking have supported voluntary industry self-regulation as an alternative to official legal bans, since the latter have a good chance of being struck down on First Amendment grounds. Total youth exposure to alcohol advertising in consumer magazines declined 48% from 2001 to 2008, CAMY found, based on its review of 29,026 alcohol-product ads in national magazines, combined with data from the Nielsen Company and GfK MRI, showing the proportion of young readers in magazine audiences. The ads were placed at a cost of $2.7 billion. However, some brands are definitely more visible than others. In 2008, CAMY found that 16 brands (out of a total 325 advertising in magazines) accounted for half the ads in publications that were more likely to be seen by youth than adults. This list included Patron Silver Tequila, Absolut Vodka, Kahlua Liqueurs, Ketel One Vodka and Jim Beam Bourbon Whiskey. The last decade has seen growing concern about the prevalence of binge drinking and alcoholism among underage drinkers, most visibly on college campuses. According to the CDC, binge drinking accounts for 90% of alcohol consumed by underage drinkers in the U.S.; 51% of 18-to-20-year-olds engage in binge drinking on occasion, resulting in elevated risks for death or injury through accidents or alcohol poisoning. Total consumer magazine ad pages increased 3.6% in the third quarter compared to the same period last year, rising from 38,985 to 40,388, according to the Publishers Information Bureau (PIB). This was the second quarter in a row where the industry saw ad pages increase. 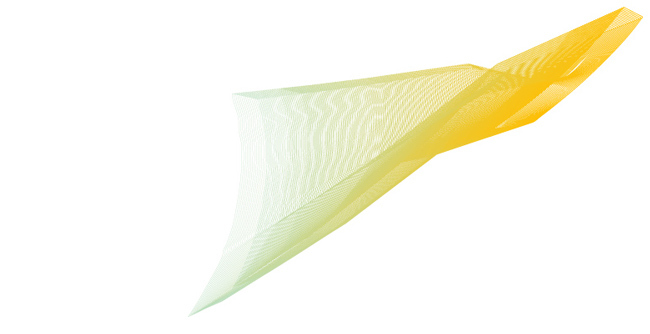 However, year-to-date ad pages are still down 1.6% to 118,717 in the first nine months of the year. Total rate-card revenue increased 5.3% from $4.54 billion in the third quarter of 2009 to $4.78 billion this year, contributing to the year-to-date total increase of 2.6% to just over $14 billion. Seven of the 12 major ad categories tracked by PIB saw ad pages increase — including automotive up 42%, technology up 12.3%; toiletries and cosmetics up 6.5%, and food and food products up 2.1%. Retail increased 7.2%, apparel and accessories 5.6%, and media and advertising 3.6%. The number of titles enjoying growth in ad pages jumped from 25 in the third quarter of 2009 to 136 this year. While the third-quarter increase is welcome news for the beleaguered magazine industry, the total number of ad pages is down dramatically from just a few years ago, reflecting a sudden, steep decline which began before the current economic downturn took hold. 2010's third quarter total of 40,388 is down 33% from 60,420 in the third quarter of 2006, also per the PIB. The year-to-date total of 118,717 is also down 33% from 178,480 in the first nine months of 2006. Declines in official rate-card revenue have not been quite as steep, but these figures are probably somewhat inflated. 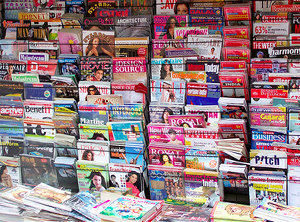 Publishers tend to offer discounts to media buyers behind closed doors. 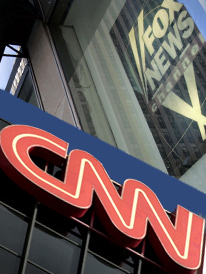 According to Gallup's annual Governance poll, conducted September 13–16, 2010, 57% of Americans say they have little or no trust in the mass media to report the news fully, accurately and fairly, for the fourth straight year. This is a record high by one percentage point. The 43% of Americans who express a great deal or fair amount of trust ties the record low, and is far worse than three prior Gallup readings on this measure from the 1970s. Trust in the media is now slightly higher than the record-low trust in the legislative branch but lower than trust in the executive and judicial branches of government, even though trust in all three branches is down sharply this year. These findings also further confirm a separate Gallup poll that found little confidence in newspapers and television specifically. 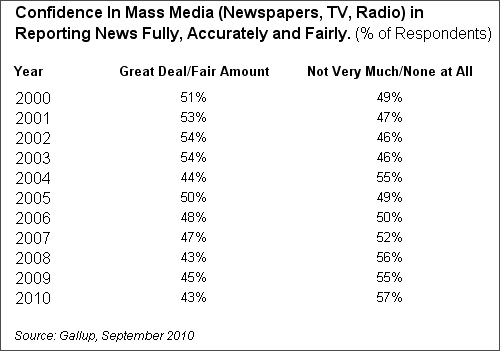 Nearly half of Americans (48%) say the media are too liberal, tying the high end of the narrow 44% to 48% range recorded over the past decade. 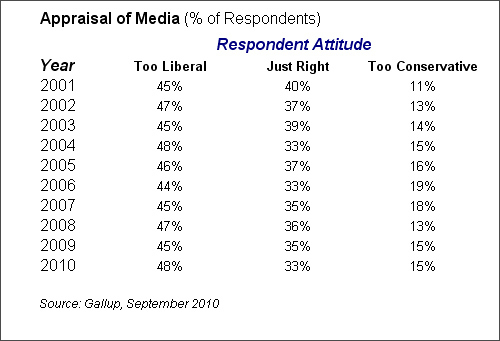 One-third say the media are just about right while 15% say they are too conservative. Overall, perceptions of bias have remained quite steady over this tumultuous period of change for the media, marked by the growth of cable and Internet news sources. Americans' views now are in fact identical to those in 2004, despite the many changes in the industry since then. Democrats and liberals remain far more likely than other political and ideological groups to trust the media and to perceive no bias. Lower-income Americans and those with less education are generally more likely to trust the media than are those with higher incomes and more education. A subgroup analysis of these data suggests that three demographic groups key to advertisers — adults aged 18 to 29, Americans making at least $75,000 per year and college graduates — lost more trust in the media in the past year than other groups, but the sample sizes in this survey are too small to say so definitively. And, according to data from the Pew Research Center, reported by Marketing Charts, people now say they spend 57 minutes on average getting the news from TV, radio or newspapers on a given day, But today, they also spend an additional 13 minutes getting news online (this figure was essentially nil in 2000), increasing the total time spent with the news by 22.8% to 70 minutes. When using the Verified Audit Circulation logo or making reference to Verified-audited data or reports, there are some important guidelines that clients should follow regarding publicity. Make sure that the Verified logo or reference to Verified is not used in any way that would imply that unaudited data has been audited by Verified. Assure that published data is sourced and presented so that it is clear which information has been audited by Verified and which information has not. Present data as it has been released. Publishers must not accumulate or calculate figures across categories or reporting periods to create other figures that do not appear in any Verified release (e.g., print distribution data must not be aggregated with website data). If any figures are quoted, the data must be factually correct and must always be the latest figures released by Verified. Any data that is reported must quote the reporting period to which the figures are related (Audit Period, Month/Year). Non-Verified audited data just be sourced as "Publisher's Claim" or other appropriate source and must not be sourced to Verified. Material reproduced from documents released by Verified must not be reproduced out of context and must convey the same meaning as it did in the original Verified report. Publishers are allowed to reproduce Verified reports for their own use. However, no modification of the report is allowed and the reproduction must be completely faithful to the original as regards the terms of the information presented and the report format. Publishers cannot provide their own information in a form derivative of the appearance of an Audit Report or Publisher's Statement. Publishers must not use the word "readership" in conjunction with data relating to the distribution of a publication. Publishers must not publicize the content of the audit report or any Verified data before the content is released by Verified. Publishers may not reproduce any communications by or from Verified or excerpts from communication unless direct permission has been given by Verified. Publishers should adhere to Verified's publicity policy guidelines. Since it is not possible to list all possible appropriate and inappropriate uses of the Verified logo or references to Verified, please contact Verified with any questions or concerns at 415-461-6006.